Why Should You Add Submerged Plants Into Your Pond? 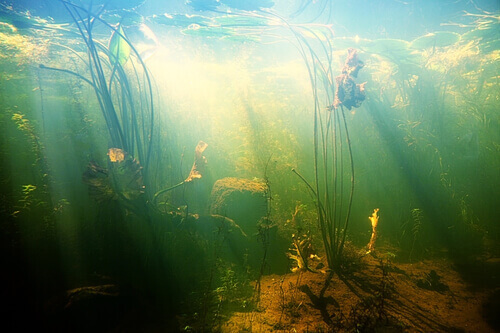 Home > Blog > Aquatic Plants > Why Should You Add Submerged Plants Into Your Pond? Many pond owners overlook submerged plants because they don’t provide the visual appeal of surface plants such as hyacinths or water lilies. However, there are a number of key benefits that submerged plants will bring to your water garden or pond, and below are some reasons you should consider adding them. Certain species of fish such as Koi can be very costly to acquire, and the last thing you want is for them to end up in the stomach of a predator such as a cat, raccoon or bird. Submerged plants give Koi fish the ability to hide whenever they detect predators. The fish will swim beneath the plants and can also use them for camouflage. The root leaves and stems of submerged plants provide the fish with ideal locations for placing their eggs. Once the eggs hatch the plants will protect them while offering a food source and a comfortable domicile. A good plant for this purpose is the Vallisneria, which has the appearance of a ribbon. It will provide grass like meadows beneath the water’s surface. Underwater plants are sometimes known as oxygenators, and this is because they produce oxygen naturally. It is a byproduct of the process known as photosynthesis, and is essential for the healthy functioning of the pond and all the animals within it. When submerged plants are combined with a good aeration system the result will be water which is significantly cleaner. While there are many underwater species of plants, some of the best for water gardens and ponds include Red Ludwigia, Red Stemmed Parrot’s Feather, and Vallisneria. While the installation of such plants may seem complex, they are not. You will want to make use of planting baskets, oxygenators and plant media. Each plant basket should be placed at the pond’s bottom, or it can also be placed on a plant shelf along the pond’s side walls. The purpose of these plant baskets is to prompt the roots of the plants to extend outward and acquire nourishment while containing the plant and preventing the fish from eating the roots. Plant baskets come in different sizes so it is important to choose one which is best for your pond. The best plant baskets have sides made from mesh which allow for nourishment from the water. Plant baskets are not always rounded and can be purchased in less common shapes such as square or even the shape of a kidney. Ponds differ in shape and you will want to select your plant basket accordingly. The plant basket allows various species of underwater plants to be installed in various areas of your pond with ease and low cost. While surface plants will provide your pond with visual appeal, it is the submerged plants which will keep the fish protected while maintaining the health, vitality and longevity of the pond itself.